Yes it's that day of the week we all look forward to - Wednesday. What about Friday, or the weekend I hear you ask? 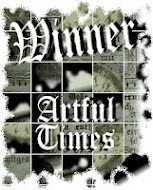 (well I don't really as that software hasn't yet been invented but give them time). No Wednesday, God's gift to nosey people who like to snoop around other crafters' workspaces, and all courtesy of the lovely Julie at The Stamping Ground. This is my desk at 4:30 Tuesday afternoon - nothing on it this morning as I had to tidy everything away ( breaks my heart to do it) so we can eat at the table as I can't eat pasta on my knee as I make too much mess - like a two year old, I'm a disgrace. Had a good afternoon Tuesday and got loads done. 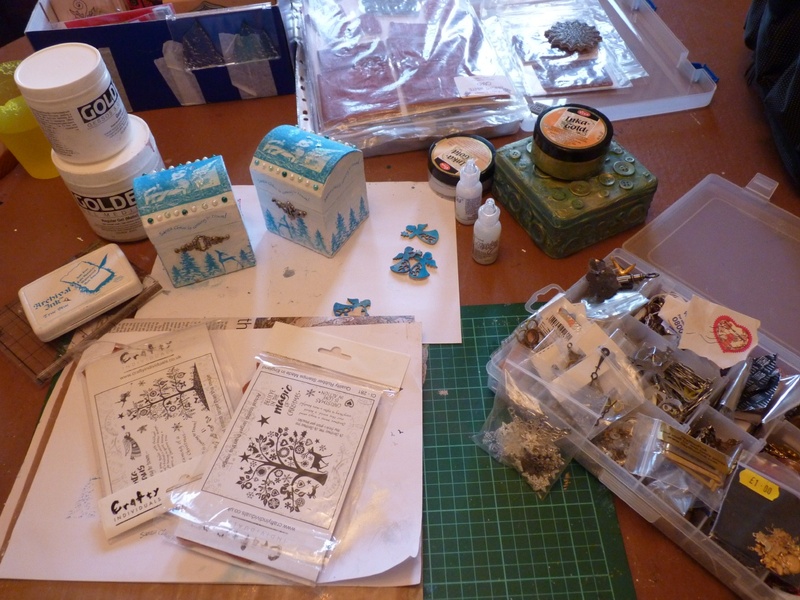 The two boxes I got for my Neices' stockings are almost finished (closer look later) as is my button tin (again, see further down the page) and at the back you can see two boxes of Christmas stamps. Not that I'm making many cards this year, stopped doing that a while ago and now only a select few get handmade cards - collectors items ha ha. 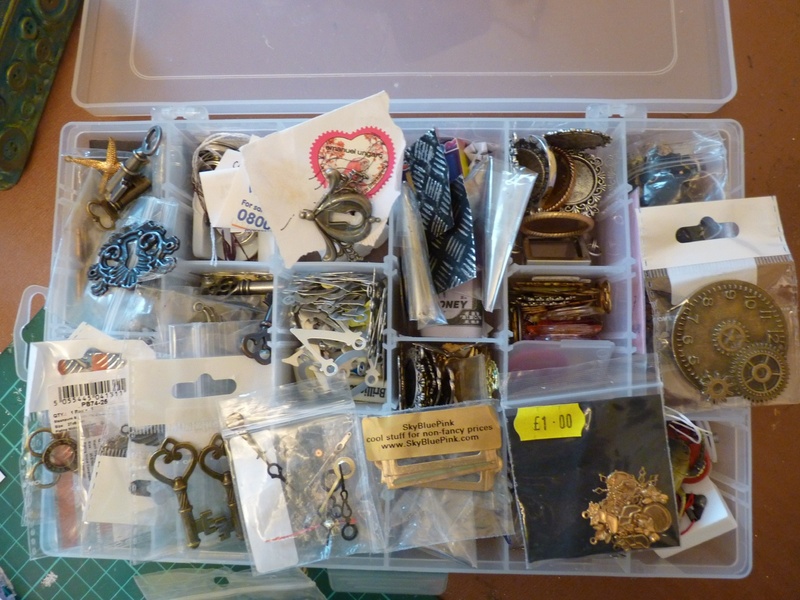 The box on the right contains all my treasures - want a closer snoop? Of course you do. Keys, watch parts, charms, locks something old, something (well lots really ) new. Anyway, enough of that here are the boxes and the button tin, both before and after painting with acrylics and buffing with metallic wax - I love that stuff. Those paints made a big difference to the tin didn't they. 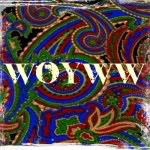 Enjoy your trip around via Julia's blog. 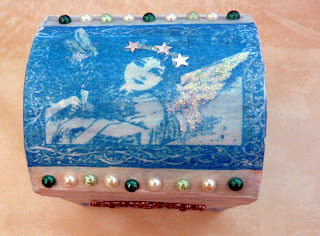 Absolutely love your boxes both the angel and the button one Gorgeous!! Hi there. Thanks for letting us peek into your creative space this week. It's always inspiring seeing where and how we create! Hope the rest of your week goes very well for you. Love the button box. What a busy bee you've been, love the boxes but the transformation of the tin after your paint job is amazing. Let me know if you can't print out the template and I'll bring one to the Vicky Stampers party for you. I love what you have done with the buttons and the metallic "rub and buff". Very clever. Those boxes have come out really nicely, haven't they? The button tin is just gorgeous, too. What did you use as a base to stick the buttons into? Oh I love the boxes for your nieces! And as for that button tin, the transformation is absolutely incredible! Good Job all round! Lovely tins there. And I spy some lovely CI stamps too! 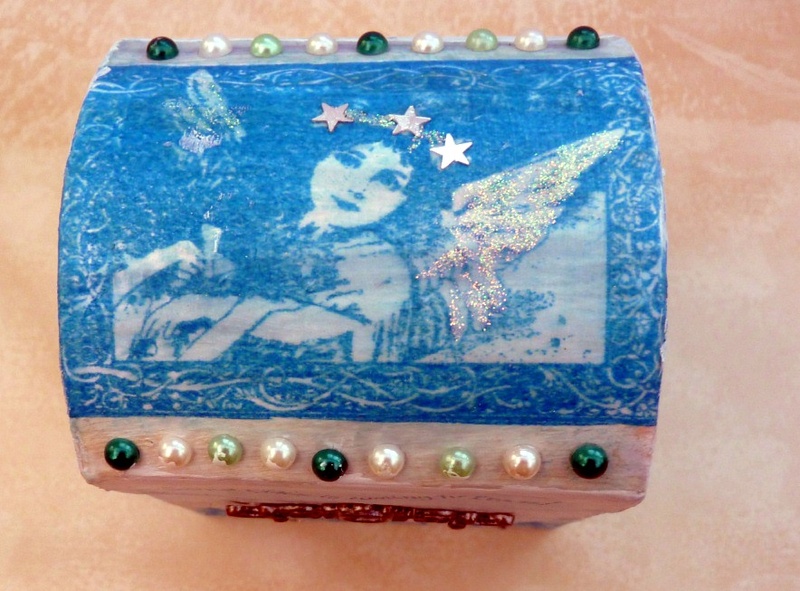 But the prize for the prettiest thing on your blog has to go to Sorrel! She is Gorgeous. 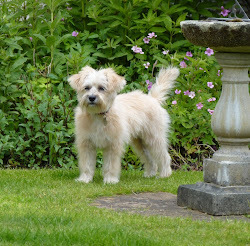 Is she a rescue dog? those tins came up beautifully....the paints made them go from lovely to amazing... with on the spag eating issues... I always wear as much as I eat!!! Those tins are amazing - love all those buttons - clever idea and thanks for the snoop around your treasures. Am so with you on the pasta thing!! 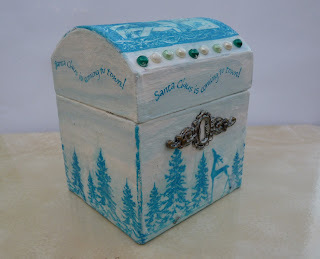 The button tin has turned into a divine work, really love it, and am charmed by the little wooden boxes, how lovely they are. I have one of those tree stamps which I must re-mount, used a cheap foam mount and regret it..stops me using it..a great reminder, thanks! 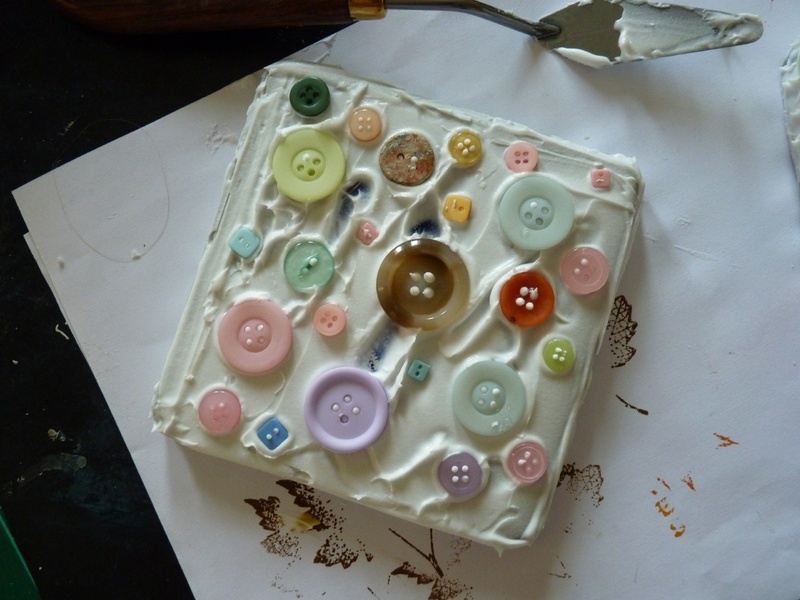 I liked the button tin before you painted it but wow dosn't it look fab in its finished state. Hardly recognise it. A fab tranformation. hugs Mrs A.
Gosh looking at your button tin reminded me really strongly of my mothers old mending tin, when I was a child! That was definatley more than a few years ago, well done!! 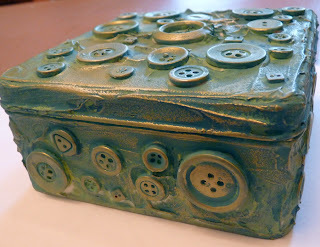 Your buttons on a box project is absolutely fabulous! It's a great idea! And I love metallic wax too. But, I am SO envious of your box of metal bits and pieces! Thanks for your lovely comments on my canvas. Sorry I am very late this week! Hi Ann. Wow! Both of these boxes are stunning. I love using the gold wax. It really has given your button box a fabulous finish. I envy you your box of treasure.